Yesterday, ATS Vice President Marc Moss, M.D., and Secretary-Treasurer Polly Parsons, M.D., along with NHLBI Director Gary Gibbons, M.D. and Eileen Rubin, President of the ARDS Foundation, spoke at an educational briefing for congressional staff on Capitol Hill sponsored by the ATS, NHLBI and ARDS Foundation. 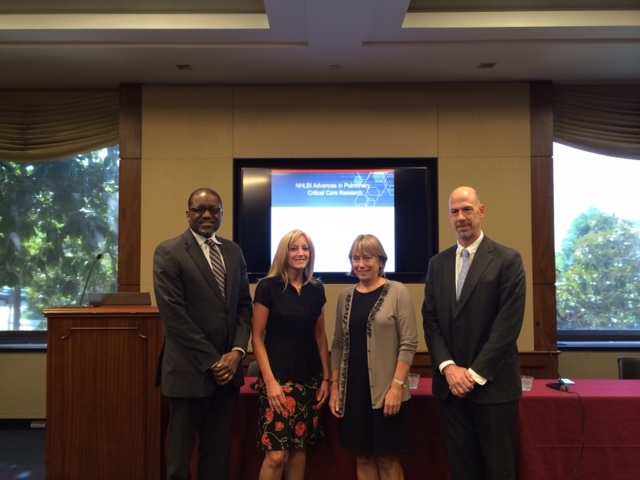 The briefing, entitled ARDS and Sepsis Research: How Science is Improving Outcomes for Critically Ill Patients, showcased research advances supported by NHLBI that have saved lives and improved long-term outcomes for patients with sepsis, ARDS and other critical illnesses. Dr. Gibbons gave an overview of the public health burden of sepsis and ARDS in the US and NHLBI's main critical care study studies. Ms. Rubin eloquently told her story of how ARDS changed her life and the enormous challenges that patients with this disease have to overcome. Drs. Parsons and Moss discussed ongoing research on biomarkers and new therapies for sepsis and ARDS, showing how these and other discoveries over the past few decades have reduced patient mortality and emphasizing for policymakers and their staff how these advances were made possible by NIH support. The briefing is part of an ongoing educational series on lung, critical care and sleep research for members of Congress and staff that the ATS sponsors with the NHLBI and patient organizations.